IN THE BROOKLYN NEIGHBORHOOD arguably best known to outsiders for much-profiled hipster-gourmet pizza joint Roberta’s, a post-Williamsburg art scene has latterly been on the rise. Bushwick has been an area of choice for artists for at least half a decade, with a cluster of galleries following immediately in the pioneers’ wake. Until now, these venues have been of the low-budget, artist-run stripe, but with the arrival of Luhring Augustine in a new location at the corner of Knickerbocker Avenue and Ingraham Street, a sea change might be in the offing. The Chelsea A-lister’s annex, a forbidding bunker outfitted in battleship gray, was once a supply center for 99-cent stores, but its transformation could hardly be more complete: The 12,000-square-foot warehouse is now dedicated to the exhibition and storage of creative projects too unwieldy for the dealership’s existing premises. Slumping off the packed subway at Morgan Avenue last Friday evening after a typical round of “L Hell,” there was no need to look up directions—everyone was headed the same way. A clutch of smokers loitered outside the gallery’s entrance, spotlit by overhead lamps, while visitors streamed in and out. An anxious-looking Roland Augustine hovered in the lobby, greeting everyone from singer-songwriter Antony Hegarty to MoMA PS1 director Klaus Biesenbach as the crowds began to fill a darkened room currently housing an exhibition by veteran filmmaker Charles Atlas. Titled “The Illusion of Democracy,” the show consists of three large video projections, all with a distinctly Matrix-like look and feel. 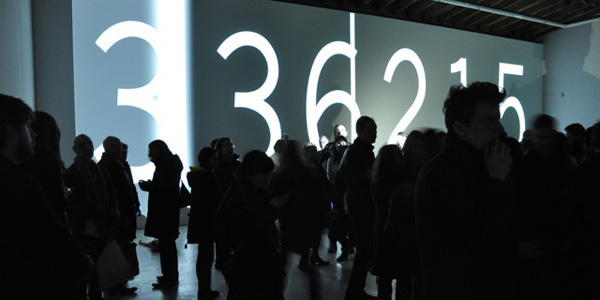 143652, the newest and largest of the trio, covers the entire back wall with a slowly shifting row of vast white numerals. Atlas’s other works on view, Painting by Numbers and Plato’s Alley, also deal in a retro-futuristic aesthetic familiar not only from the Wachowski Brothers’ blockbusters but also from the work of artists like Ryoji Ikeda, whose video installation The Transfinite took over the Park Avenue Armory in similar style last spring. It must all have seemed rather a switch for those more attuned to Atlas’s collaborations with the likes of Merce Cunningham, Michael Clark, and Yvonne Rainer. But the videos are consistent with their maker’s apparent recent interest in revisiting his childhood experience of tornado alerts. If the work’s adult viewers responded by huddling together, their children were happy to plunge into the eye of Atlas’s storm, hurtling through the forest of legs and slapping the walls with gleeful disregard for its fresh paint job. Left: Visitors at Luhring Augustine Bushwick. Right: Artist Emily Harris with Risa Puno's installation Good Faith & Fair Dealing at NURTUREart. So had the new kids on the block struck the right note? A quick straw poll found most attendees in agreement that the place felt weirdly as though it had been airlifted straight from West Twenty-Fourth Street. One guest described it as a “time capsule”—presumably from the future. Jerry Saltz, Roberta Smith, and Walter Robinson were all on hand to add their particular brands of critical props or condemnation, but there didn’t seem to be a great deal at stake in the project beyond its style (incongruously sleek for the area) and timing (likely prescient). As the space filled to capacity and the temperature began to rise—with nary a beer, wine, or water in the offing—I roped artist Emily Harris into the compare-and-contrast exercise of sampling a couple of other local openings. First up was NURTUREart (“our name is our mission”), which relocated from Williamsburg to its current home on Bogart Street a few months ago. Second was English Kills, which has occupied a Forrest Street basement since 2007. Friday, both were launching scrappily entertaining group shows and attracting a more characteristically local clientele. “Systemic Risk” at NURTUREart was the busier of the two, with Risa Puno’s maze-game installation Good Faith & Fair Dealing providing a playful, playable focus. The unveiling of “The Permanent Collection Volume 2: My Own Private Serpico” at English Kills was a quieter affair, but refreshingly so, with a friendly, familial vibe. Where the night’s main event was driven by hype and spectacle, these folk kept things cool. I wonder which crowd the mob I later saw being busted—presumably for outdoor boozing—back at the L train stop identified with.